Sorry guys, while your beards are impressive, we awarded our Charity Cup Longest Beard trophy to “Sir” Lewie Pickering of Jackson Center. While we appreciate your effort in “growing” this fine crop of beards, we’re pretty sure that Lewie logged a little more time to grow his! All of this beard talk was sparked by our annual Sidney Choice One Charity Cup. This year’s theme was lumberjack-inspired, which meant there was no shortage of flannel, pine cones, and beard measuring, both real and fake. 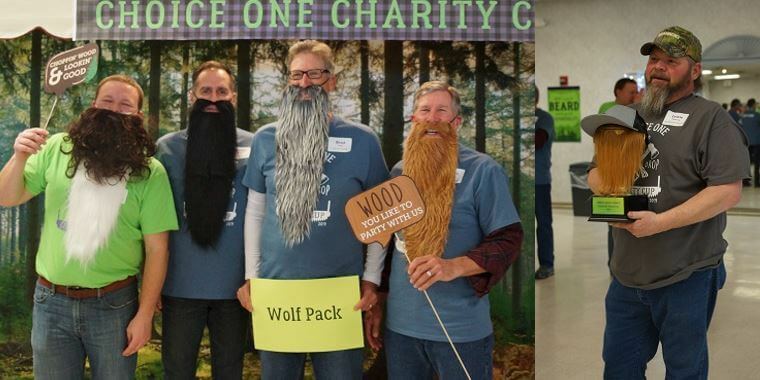 And while our beard-fakers were a little stumped as to why they didn’t win that incredible-looking Longest Beard trophy, they can’t be disappointed in the generosity of everyone who attended this year’s event. Thanks to your contributions, we were able to raise $7,538.00 for the Miami Valley Down Syndrome Assocation and Jerry and Charlie’s Helping Hands! With a great beard comes great responsibility, and we are positive that we saw both our bearded and unbearded friends step up to the plate for this year’s event. We can’t thank everyone enough for your support and participation, and we hope you had a wood… er… good time. We’re plaid you came, and hope to see you next year! P.S. If you want to join Choice One and the MVDSA on July 20, 2019, for the Family Picnic funded by our Charity Cup, let us know!